Nanzuka Underground is pleased to present “Kochuten”, a solo exhibition of new works by Keiichi Tanaami. In this exhibition, we show his 10 works of new paintings inspired by Chinese traditional story in the book of the later Han. 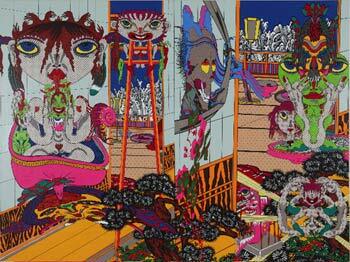 Keiichi Tanaami was born in 1936 in Tokyo and graduated from Musashino University of Art. Since 1960′s, he has been the one and only artist, who worked actively as graphic designer, illustrator, and artist, without being limited to media or genre, or rather beyond them. While a university student, He was associated with artists such as Ushio SHINOHARA and Tomio MIKI, the leading figures of Neo-dada Japan, then after his graduation in the middle of 1960′s, he was influenced by the psychedelic culture and Pop art, and has been making works widely such as films, silk-screens, paintings, and sculptures. Especially the encounter with Andy Warhol in the end of 1960′s, got him triggered, and he has kept experimental tries against main problems in the contemporary art scene, such as “art and design”, “merchandise and art”, and “connection between daily life and beauty” until today. ‘Kochuten’is the theme for Tanaami’s new works, which is based on Chinese ancient story. “There is a heaven even in a pod”, explaining the importance to have and deepen own utopia, even living in this world. He painted his utopia being strongly inspired by it’s concept “own small universe existing in a pod”. Tanaami shows his own world with the original motifs of various artists, whom he was influenced by in his long creative activity, such as Warhol, Lichtenstein, Chirico, Picasso, Escher, Hokusai, Kyosai Kawanabe and Fujio Akatsuka. It is the mysterious world in where they are living together with Tanaami’s original characters such as odd looking gold fish, girls, and creatures. And there are also many important elements for Tanaami’s work, such as beam, explosion and spiral pines, which are associated with his experience of the war and disease. Tanaami describes his own experience in the World War II as following. “I still wonder if it occurred in the real world or not. In my memory, it has been obscure and the real world and my dream have been mixed.” However Tanaami has described throughout his extreme experience in the war and disease which made him hover between life and death, these his new works show his ultimate utopia. *** For inquiries please contact the following.